Scientists are studying the Van Allen Radiation belts to gain a better understanding about the radiation encircling the Earth. It was once feared that these electrons and radiation would affect people on Earth and it was thought particles would precipitate downward out of the belts. Researchers recently theorized that maybe particles could sweep outward and by studying the Van Allen belts further with the use of NASA spacecraft, scientists hope to better understand disturbances created in the magnetosphere and why these storms can cause a sudden drop in the radiation belt particles. When scientists discovered two great swaths of radiation encircling Earth in the 1950s, it spawned over-the-top fears about “killer electrons” and space radiation effects on Earthlings. The fears were soon quieted: the radiation doesn’t reach Earth, though it can affect satellites and humans moving through the belts. Nevertheless, many mysteries about the belts – now known as the Van Allen Radiation belts – remain to this day. Filled with electrons and energetic charged particles, the radiation belts swell and shrink in response to incoming solar energy, but no one is quite sure how. Indeed, what appears to be the same type of incoming energy has been known to cause entirely different responses on different occasions, causing increased particles in one case and particle loss in another. Theories on just what causes the belts to swell or shrink abound, with little hard evidence to distinguish between them. One big question has simply been to determine if, when the belts shrink, particles escape up and out into interplanetary space or down toward Earth. Now, a new study using multiple spacecraft simultaneously has tracked the particles and determined the escape direction for at least one event: up. 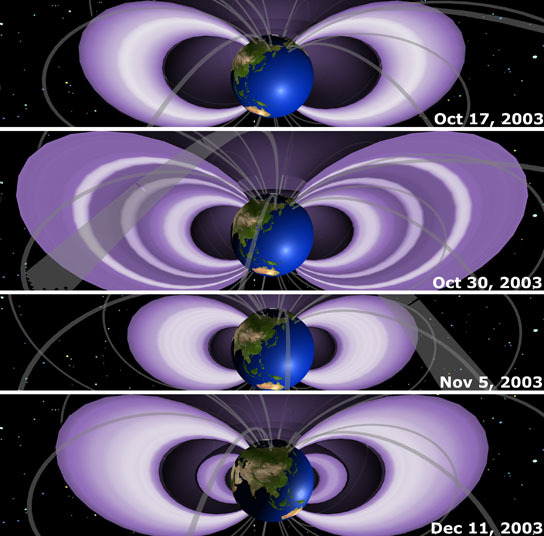 From October to December 2003, the radiation belts swelled and shrank in response to geomagnetic storms as particles entered and escaped the belts. While it may sound like a simple detail, such knowledge is not just esoteric. Indeed, the study of particle losses in the belts has so far provided more mystery and potential theories than concrete information. But understanding the radiation belts – and how they change as particles and energy come in or go out — is a crucial part of protecting satellites that fly through the region. The Van Allen belts fit into a larger system that stretches from the sun to Earth. The sun sends out a constant stream of solar wind, not to mention occasional much larger bursts – such as explosions from the sun’s atmosphere called coronal mass ejections (CMEs) or shock fronts caused by fast solar winds overtaking slower winds called corotating interaction regions (CIRs). When these bursts of energy move toward Earth, they can disturb Earth’s own magnetic environment, known as the magnetosphere, and create a geomagnetic storm. Sometimes these storms can cause a sudden drop in the radiation belt particles, seemingly emptying the belt in only a few hours. This “drop out” can last for days. What causes the drop out, why it lasts so long, and just how the particles even leave remain unanswered questions. 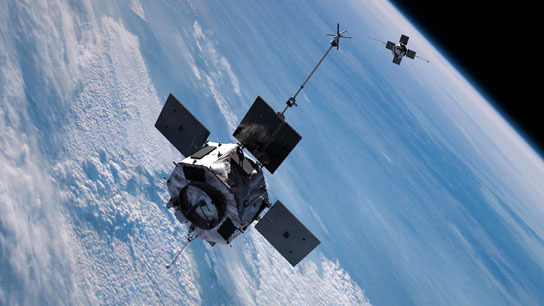 Artist concept of the twin Radiation Belt Storm Probes spacecraft, scheduled for launch in August 2012. Solving such a mystery requires numerous spacecraft measuring changes at several points in space to determine whether an event in one place affects an event elsewhere. The Radiation Belt Storm Probes (RBSP), scheduled to launch in August 2012, are specifically geared for such observations, but in the meantime, a team of scientists have brought together two disparate sets of a spacecraft to get an early multipoint view of the radiation belts during an event when the belts experienced a sudden loss of particles. By harnessing the observation abilities of the three THEMIS (top), two GOES (middle), and six POES (bottom) spacecraft, researchers could observe events in the Van Allen radiation belts from numerous viewpoints simultaneously. In this case, the team observed a small geomagnetic storm on January 6, 2011 using the three NASA THEMIS (Time History of Events and Macroscale Interactions during Substorms) spacecraft, two GOES (Geostationary Operational Environment Satellite), operated by the National Oceanic and Atmospheric Administration (NOAA), and six POES (Polar Operational Environmental Satellite), run jointly by NOAA, and the European Organization for the Exploitation of Meteorological Satellites (EUMETSAT) spacecraft. The THEMIS and GOES spacecraft orbit around Earth’s equatorial region, while the POES spacecraft orbit at lower altitude near the poles and travel through the radiation belts several times per day. All are equipped to study the energetic particles in the region. The observations provided an unprecedented view of a geomagnetic storm from numerous viewpoints simultaneously – and the team found unequivocally that particles escaped the radiation belts by streaming out into space, not by raining down toward Earth. During this storm, electrons moving near the speed of light dropped out for over six hours. In that time period POES saw no increase in electrons escaping downward from the belts. On the other hand, the spacecraft did monitor a low-density patch of the belt that first appeared at the outer edges of the belts and then moved inward. This sequence is consistent with the notion that particles were streaming outward, just as the low density region of cars leaving from the front of a traffic jam moves backward over time as more and more cars are able to move forward and escape. If, indeed, electrons usually escape the radiation belts by streaming outward, it seems likely that some kind of waves aid and abet their outward motion, enabling them to reach the outer escape boundary. Hammering out this escape mechanism will be one of the jobs for RBSP, says David Sibeck at NASA’s Goddard Space Flight Center in Greenbelt, Md., who is NASA’s mission scientist for RBSP and project scientist for THEMIS. Be the first to comment on "NASA’s THEMIS Satellite Records Effect of Geomagnetic Storms on Radiation Belts"